I stomped around the house in a huff on Friday morning before heading out to my nephew’s wedding. When I mentioned it to one of my sisters, she replied, “I can’t see you doing that.” But I did. I really did. I don’t have a temper, and it’s not typical for me to slam doors or throw fits, but I was frustrated about too many things at the same time, and I thought maybe you could relate–and that you might want to know what got me out of it. We’re here at LearnDoBecome to strengthen families, and when we can win the game that’s going on inside our heads, the ripple effect on our loved ones is huge. (2) Then I realized the plastic bin I bought for chopped vegetables didn’t fit in the fridge, and Eric casually mentioned that perhaps I should have measured the shelves before buying the container, and I pretty much exploded in the kitchen–asking WHY he had to point out my weaknesses when I can CLEARLY see them. (3) I couldn’t eat breakfast because I got some kind of food poisoning earlier that week, and the sickness had affected my schedule, so I didn’t get as much done as I’d hoped. (4) And with the wedding going on, we had family in town, so there were several additional activities, and I was exhausted. (5) Then my eight-year-old was playing with toys instead of brushing his hair and making his lunch for school, and as we were throwing food into a lunch sack three minutes before he had to go out the door, I was absolutely convinced that I had failed as a mother. On the drive to the wedding, however, I had time to assess what was really going on. And it comes down to this: I want to be perfect. Right now. I want the straight line and the smooth path. I want to implement all the good things I learn, and I want to get them right the first time. I want my reality to match my vision…immediately. There is no way that any of us can implement every good strategy–all at the same time. And anything worth accomplishing is going to include some missteps. But that doesn’t mean we give up. It means we shift our perspective. (1) There is something empowering about seeing our lives as imperfect journeys. The word “perfect,” in fact, is often misunderstood. It comes from the Greek word “telios” which actually means “complete, whole, fully-developed.” It does NOT mean flawless or without error. It means growing, doing, and becoming…. The reason our journey is imperfect is because it is not yet complete. I’m not finished building my marriage, teaching and enjoying my children, exploring the world, or doing my part to make an impact on the lives of others. (2) Peace and joy come when we’re pursuing the ideal. It isn’t motion that exhausts us. It’s being stagnant. When we’re giving our all to a relationship or a project, something deep inside us knows we’re becoming a higher version of ourselves. And when everything goes wrong, we’re still gaining experience. THAT has value. (3) It’s the struggle that brings us together. If you think about the people you love the most, they’re most likely the people you have served the most–or the people who have served you the most, especially when life hasn’t gone as planned. A few months ago, I realized we will probably never have a tree house in our backyard. It had been a dream of mine for my entire life, but because other things have taken priority (like weekly visits to my mom, who has Alzheimer’s), the time for the tree house has passed. It brought tears to my eyes as I realized I finally got it–even if it didn’t come in the way I expected. And it’s because of the years and years of struggle that Alia’s kindness meant so much to me. I keep thanking her over and over again. The vegetable bin is in the car, waiting to be returned. I’m excited to have you here with us at LearnDoBecome. Thanks for being with us on this imperfect journey. 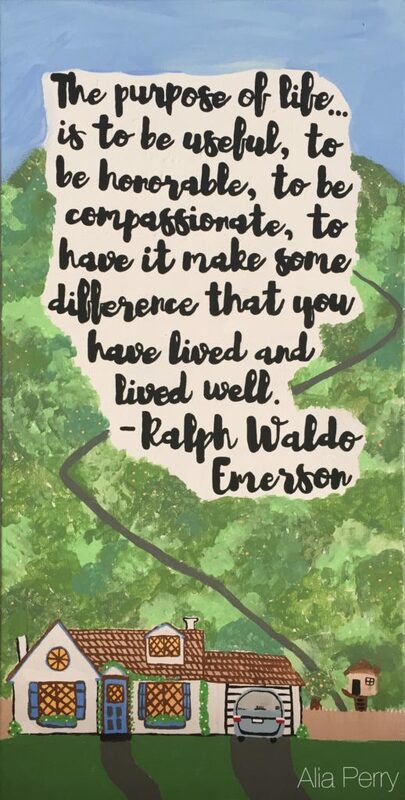 We hope that through our small efforts, we can make a difference for you–and support you as you make a difference for others. LearnDoBecome Challenge: Consider your own struggles (whatever’s currently frustrating you!) and identify at least one way you can shift your perspective so that you can more fully enjoy your imperfect journey. 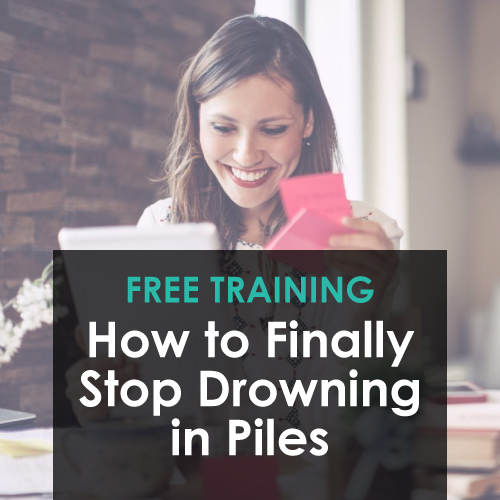 Have you downloaded your free guide yet? 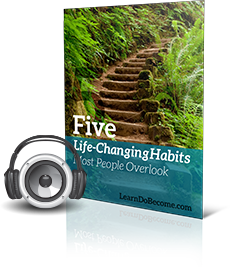 Five Life-Changing Habits Most People Overlook. You’re the best, April. I’m so sorry you got food poisoning and have had so much going on! I have tantrums too..and no, I can’t see you having one. Alia’s canvas is beautiful and I LOVE the tree house! (Way to go, Alia!) I have a painting of the Grand Tetons on my wall because I can no longer wake up to them like I did growing up. While I still miss the mountains, I don’t complain as much about not living by them as I’ve realized that it’s the people around me that matter most. It’s hard to let go of those dreams that may never be realized! (Living by the mountains again for me!) I appreciate the insight. I have a hard time being okay with “imperfect,” but you are so right–it is an essential part of the journey. Sending hugs your way! (Slap. Kick. Punch😩) anyhow, I just want to share this really resonates with me. I’m not sure either but I am glad I read this email! Thank you! I work 12-14 hours a day and feel I am suppose to perfect at home and every where else. It’s hard to. This helped me! Thank you for sharing this. It is definitely nice to know that we’re not alone. I get frustrated because I want so much for my kids. I want them to be kind, and thoughtful, and selfless and courteous, and considerate RIGHT NOW!! But I love your thought about if it was all right now the journey would be over. I need to be more patient and understanding as I teach them these things. Other wise all they will remember is me yelling at them to BE NICE instead of me showing them how to be nice. Melissa, I had to laugh because I was trying to get my boys in bed, and they were totally dawdling tonight. I read your comment and remembered that I also want my boys to see me being nice. 🙂 Thanks! You made a difference in our bedtime routine tonight! I agree with your sister, it is nice to know we are not alone. I had a tantrum myself on Saturday (I’d like to call it little…not sure that’d be accurate though). Thank you for such a wonderful post. They always make me feel better about myself and how I’m doing. Thanks for your comment, Amber. I was so worried tonight as I posted this…wondering if I was just cluttering up people’s email inboxes, and wondering if people would respond with comments like, “I have no idea why you have tantrums.” It helps to know we’re all going through this together. 🙂 Thanks again!! Perfection paralyzes me. 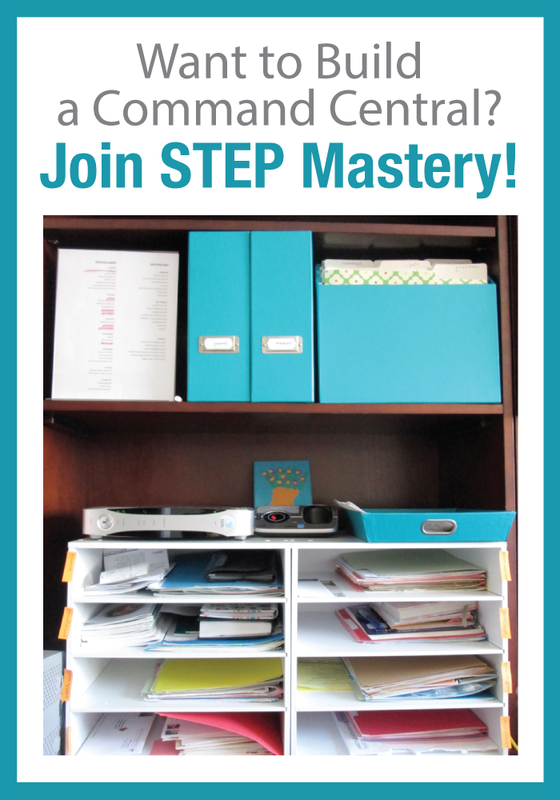 This was so helpful to hear that I’m not yet “complete”…it helped me shift my focus. Keep on being real April, it’s refreshing. Thank you! Dear April, I have read so many of your posts and have listened to so many of your podcasts that I feel like I know you. I finished listening to Essentialism recently since I enjoyed your podcast with the author. The short podcast that you did several years ago about the 9 most important minutes a day changed the way that I looked at the interaction with my children. I am much more intentional about those 9 minutes each day and truly cherish them. My oldest child has autism and is 13 years old. There are some days that are really tough and I question my purpose as a Mom. On those low days I have found that when I share my challenges with another Mom, and she relates to what I’m going through, I can look at my situation through different eyes and remember my higher purpose. You have inspired me in so many ways over the years with your compassion, honesty and wisdom. Thank you, as always, for sharing your journey with us. 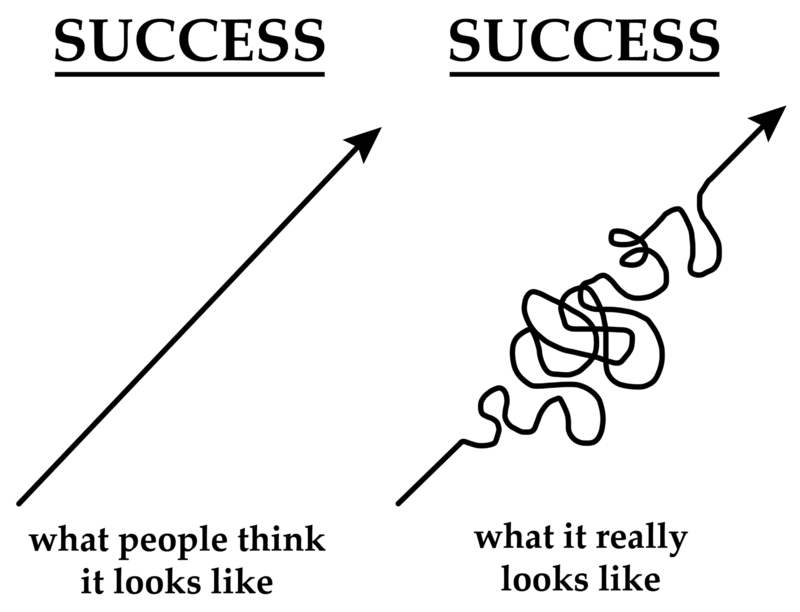 I love the drawing of the path to success! I feel like that image will help retrain my brain, when I want everything to be perfect, right now. Just reframing the word ‘perfect’ – SO powerful!!! Thank you for sharing your struggle. You had a message just for me in this post. The “When Panic Attacks” book, that just came, came. I opened it up to read, and the chapter opened up to the part where this TOP lawyer guy was challenged to ask ten other lawyers to admit he’d lost a case (although he hadn’t, I guess,) to see their responses. 5 were too busy talking about themselves and their experiences and boasting about their own wins to listen and to care to hear what he said. The other 5 were relieved to hear and shared about how they were having trouble with their children and their marriages and how they loose cases sometimes and finally felt human. He’d made friends. I finally human finally too. Bawled my head off. Streams pouring out of my eyes. He’d connected WITH people. I’ve been performing puppet shows to the community, really incredible ones, ones with endings made up that change the plots to make them one-of-a-kind and inspiring. The list goes on and on. While the puppet theater in my own home goes unfinished… It is just one example of countless ones. Thank you. 🙂 Needed this. Thankyou April! In the midst of all our stressful lives, your article made me to pause , reflect , make peace with imperfection, and work on improving myself to love my loved ones better. Very well written and timely. Thanks a lot! 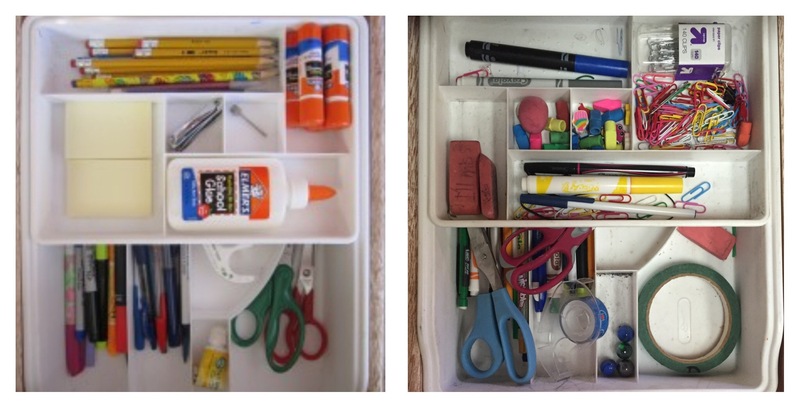 Wow, I would love to have a pencil drawer like your Messy one. LOL. We have to remember, when we compare ourselves to others, (who we feel have it all together), we are comparing our worst qualities to their best qualities and we will always fall short . You are correct…. Keep our eyes on the Journey, making memories along the way!!!! Yes! I can definitely relate to this, and you explain it beautifully. And because you make such an impact on our lives (I seriously think you have saved my life, April), it just helps me feel even more understood, and closer to you and this community of mothers. One of the greatest dangers for a woman is to feel like she is alone. Thank you so much for what you do! Beautifully written! I needed to hear exactly what you wrote. Alia, your painting is gorgeous! I have a situation where I do need to shift my attitude and decide it is also part of my path to success. Thank you for the encouragement! Your sister definitely hit the nail on the head! We do want to know we’re not alone! 🙂 Life is constantly throwing curve balls at us and we can still enjoy it even when those curve balls come-a lot has to do with our attitude and perspective. This article was a great reminder of that, and although I’m not glad to hear you struggle, I am glad to know your struggles are similar to mine and how you went about coming out of your “tantrum”. Thanks for sharing! Thank you for sharing this April. I could relate to it because tantrums or meltdowns, whatever I call them, I have them. Like you, people around me find it hard to believe they happen. Except for my husband because he is generally a witness. I find I usually have them when difficult situations are happening and I haven’t adjusted my routine to account for it. Sometimes it’s like I am unwilling to acknowledge I’ve got one or more difficult things going on and I want to go about business as usual. The truth is, we all get 168 hours in a week. If something comes up such as illness or a big family event, I have to learn to account for that and adjust accordingly. Love and belonging are basic human needs so your sister is absolutely right, we like to know we are not alone. As a psychologist sitting across from clients in my big leather chair, I see many of them assume I have it all together and all figured out. I see it in their eyes as they shamefully disclose their perceived failures, negative thoughts, and shortcomings. After letting it out they sit back cautiously, waiting to see if I will affirm they are a complete mess. Sure, it’s true I have training in techniques which can guide them in the direction they hope to go. However, I find it more helpful, especially in the beginning when I meet them with kindness and compassion. When I reassure them they are not alone. When I tell them we are all growing and learning together in the journey called life, me included. So thanks again for sharing April. We all need to be reminded sometimes. This was just what I needed to hear today! I love the illustration of success! Thank you for voicing and thereby giving permission to have off days! By the way, I am an artist and that canvas your daughter created was absolutely amazing. She has a true gift and I can’t wait to see how she blesses the world with it! Thanks for sharing this with us, it’s nice to know that we’re not standing alone. There’s a book that was highly recommended to me by a dear friend that might be helpful to you too, it’s called “The Purpose Driven Life”, it puts into perspective why we were put on this earth and our reason for being, it’s not about being PERFECT, it’s about loving ourselves and God enough, that everything else falls into place. Thanks again for all you do April!!! Thank you so much, Debbie!! I have that book on my shelf and can’t wait to read it. I so appreciate your support and for being with us in this community. Much love! Hi April, I relate so much to your article. I feel so overwhelmed. I have a ten days before school starts. I am so behind in what I wanted to finish this summer. I want to scream. But then it would be too much energy. Instead I am writing a list of all the positive things I completed. I need to find some forgiveness for myself. Go forward and not beat myself up. Hugs to all that are going forward! Loved hearing about your “adventures” and loved your honesty. Sometimes it is hard to focus on the one thing that went right and not focus on the zillion that went wrong. Not sure why we do that. And of course it is nice to know that someone else out there struggles daily…we often think “stuff” happens to just us! The success photo… THAT pretty much sums it up! Thank you for sharing.. I will print this post out…. I feel like I am looking in a mirror. I try so hard to be perfect, I forget to enjoy the moment I am in. I try not to shake that balance when everything is going right. I don’t enjoy that things are going well, because I am waiting for the shoe to drop. April, Thanks for sharing your tantrum with us. We don’t expect you to be perfect but we get caught up in our own perfectionist ideals. My tantrums usually happen when my family is not performing up to my expectations! What’s really funny is how I expect them to do things that I haven’t even shared with them. My ideal is in my head. I’m seeing improvement though. I told my boys about the school paper landing spot. It has already been helpful to me and them in locating papers to turn in. We’re getting there on organization. “Progress not perfection.” Love your daughter’s picture. Sweet! The # 1 word my husband and I have always come back to in situations in our 28 years of marriage is EXPECTATIONS! They are what bring things back into perspective. Prayer also helps us get there when we are exhausted and overwhelmed. The enemy wants us to continually feel out of sorts even in the little things so we are ineffective in our relationships. Claiming our victory over in all is in Christ everyday! I wish I had learned these lessons you are sharing at a much younger age. It would have saved a lot of tantrums! Oh April, that was the sweetest post. My heart aches for you about your treehouse (a lifelong dream of mine as well, just bought a house on 6 acres so hoping we can make it happen! ), And I love the tender mercy from Alia. So sweet. 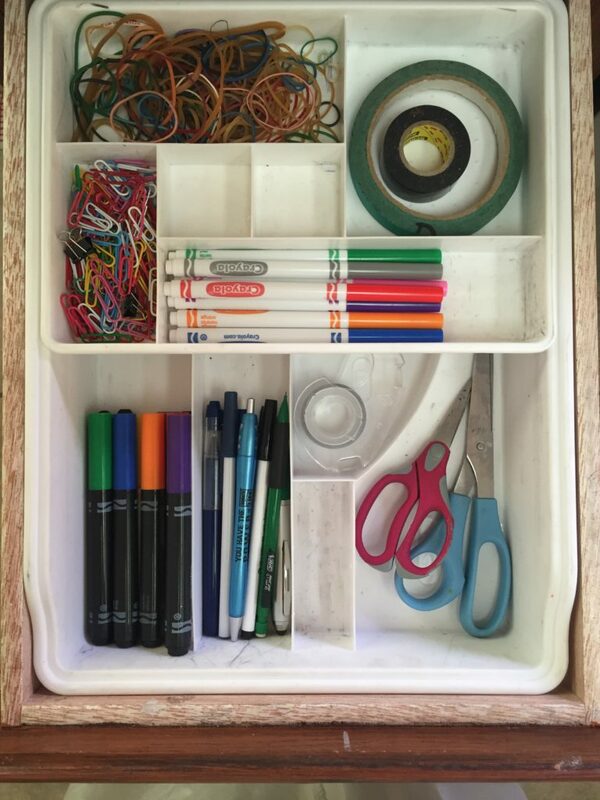 It is good to know that even though you seem to have so much of it together, your pencil drawer still gets messy… Reminds me that maybe it’s not just me, but just life. Hugs. Great connecting with and supporting each other! Although, we already know these things, we need the reminder and different perspectives to bring attention back to the things that are important. Some days I feel I have it all together, but most days I don’t feel so secure. The definition you provided for perfection, really made an impact on me… and you’re right I’m not ready to be done. Dusting myself off is the hardest part, I’d rather blame something else, but once I do acknowledge I could have done better and admit my “failings” and decide to get and try again, it’s such a relief. And I feel I grow instead of fester. I see you have great support in your family and friends. That in it’s self is a grand accomplishment. Yes, we have to keep at it to maintain, nuture, and grow. As you said being stagnant exhausts – takes our energy. We have to keep moving. Our bodies and minds depend on it. I’ll admit, too, that I was drawn to the title of your email to read it. I needed that connection. We shouldn’t beat ourselves on our errs, but taking the moment to see what’s really going on is important to our growth. Thank you April and everyone for helping me take a moment to “breathe”. Great demonstration as to how your dreams manifest. Not always in the ways we expect, but when we least expect them they are even more precious. The piece I relate to the most is wanting to implement everything “right now.” Oh, how I long to be perfect….right now! One of the toughest things to come to grips with in life is that it is the journey/process that actually makes you what you want to become. Give me a magic want…some fairy dust….anything….to give me those results instantly! But it just doesn’t work that way. You have to slog along that windy, twisty, difficult path to become the person you long to be. Blessings, and may your pathway grow less twisty the longer you journey! We are walking the same narrow road… let’s smile at each other along the way! I was in the car last week… got super mad at my husband and he asked me, have you not been reading your Bible? I said something like, Yes, I haven’t been reading the Bible. (Guess it showed.) Me too, your title caught my attention. I can’t thank you enough for this post. It REALLY hit home with me! The visual is exactly how I think! I don’t want to fail, I don’t want the process, I just want the result and to have smooth sailing getting there! I regularly get overwhelmed by projects I’ve just finished and find messed up again, like your drawer. Thank you so much for writing this and letting me know that you too are in this place at times!!!!! Practicing violin with my daughters usually is more grump than great. I want that steady, straight line of progress, but I’m going to think of the curly line going everywhere–and use my daughter’s curly hair that also goes everywhere to remind me of this image! Thanks for sharing Dear April. I can’t thank everyone enough for these awesome comments. I feel like our LearnDoBecome community is coming to life as all of these voices come out in support of each other. I have read every single comment, and I feel so blessed and lifted. Thank you!!! Thank you for sharing today! I loved your definition of “Perfect”. So, if I were to take it a step further, then “Perfectionism” could mean “looking to the completed”, probably without enjoying the process, which is the point, right? To enjoy the journey? To understand the things we need learn on the way that develop our character and make our lives complete? or Perfect? 😉 Thank you! I needed this today! Every time I read a post or blog, I end up crying. (Let’s chalk that up to my first son entering kindergarten on Monday.) My partner and I are trying to take over the world with work, home, school, and the many causes we support. To have the validation that there are others who struggle and succeed, we see the light. Your words and experiences help us along our multi-faceted journey. I like reading your posts because you are real, honest, and easy to relate to. We all throw fits, but no one wants to share their “weaknesses”; so, it is nice to realize we are not the only ones. – And we can then be a little more patient with our kids when they are struggling as well. One of my favorite parts of the recent podcast with Greg about essentialism was the metaphor about being off track 90% of the time but keep coming back. It has been on my mind a lot lately how being a mother is a “practice” and the most important thing is to keep on trying. It’s the persistence not the perfection. I love the graphic about success – it’s so true and I need to remember that more often! Thanks for sharing this post. Thank you so much for this post. I too have been having troubles lately – I am up against what seems like an impossible deadline to publish my third children’s book while still having all my other duties for my freelance clients, at church (3 callings) and in my community (5 committees). I am so overwhelmed and the least little thing sets me off. After reading your post, I remembered that I have the ability to look at bumps or hiccups in a way that helps me grow instead of sends me to bed in an anxiety attack. I’m so happy to be a part of this community. I truly enjoyed this post. Thank you for sharing that you are still a work in progress, as we all are. When I have one of my tantrums, I get very frustrated with myself, because most of the time I take it out on my family while I am really frustrated with myself (feeling so overwhelmed and not getting much accomplished). It reminds me of a song my kids used to sing, “He’s still working on me”. I truly am a work in progress. I don’t want to be finished either. Thank you for putting it that way and thank you for sharing this story, April. It does make me feel less alone. It’s incredible how neatness inspires creativity in our children. I noticed the glue hadn’t returned yet as of this posting but some new or previous occupants had appeared. There’s always something ready to fill an empty space! It still looks great again, though! I actually dreamt (had a nightmare?) about my own disorganization last night. For some reason, in the dream I woke up to extra people – everyone has a friend over – and each of them wanted something that should have been pretty easy to locate but absolutely was not. Thank you, Suzy! So grateful you’re with us. And yes…the glue has been moved to the art cupboard. Not so many glue projects anymore now that the kids are getting older. 🙂 Hope your organizing is going well!! I really love your articles. They are always so uplifting and make us all realize we aren’t “crazy”, that everyone has those experiences. Often when I have a tantrum, I feel guilty that I’m making life harder for my husband, “Why can’t I be a normal wife?”, “Why do I freak out a lot?” I’ve realized, through your encouragement, that I need to get the right systems in place and choose my priorities. I don’t think you should give up on your treehouse dream. You could one day make it as a cool hang out for your teenagers (have you seen “About A Boy” tv series?). Or you could eventually make one for your grandkids. It’s not too late. As a side note, I would love to know what task apps or task websites you use. I know you’ve mentioned kanban flow, but I thought at one point you had mentioned a few others you started using. I couldn’t seem to find the info so I thought I would ask. Thanks. Thanks for your comments! I tackled a drawer next to my dish washer that always gets dummped in. It still doesn’t compare to your drawers but it is an improvement what what it was earlier. Another question? My family seems to collect pens and markers in abundance but can’t seem to find out when they need one? What do you do with all the extras? Throw them away?!! Just curious how to control the amount of pens and unwanted writing tools from taking over the drawer!!! Thanks again. Am making baby steps. Wow! The universe works in mysterious ways! I took a drive after a small “meltdown”. I actually felt like running away. I have a wonderful family, but like you, juggling my family and work, actually two companies can be very overwhelming. I’m so burnt out and feel like a failure in it all. I know that I’m not, but “feel” like it. I’m sitting in my car writing this because I was meant to read your blog and other replies via Facebook. Thank you all for sharing your struggles and how you are handling them. I now don’t feel alone in my own struggles. Just got time to read your e-mail, couldn’t have come at a better time. Yes it is nice to know I am not alone in the boat. I am sorry for all that happened to you. But today, I had a serious crying melt down. Too much to do, too little time, and I should have done some of these things that I had to do today sooner than today. I didn’t want to do any of them, but had no choice. I seriously cried my eyes out! I did get everything accomplished and it does feel good to finally have these things accomplished. Hello April, and all you wonderful ladies out there! The timing of this was great for me, too. I’m doing my best to try to juggle a number of responsibilities, roles, goals, and tasks. I’ve only recently realized that I have been nearly a lifelong perfectionist, and surprisingly was struck with wonder for a while why I didn’t have it all together despite my best efforts and intentions. Then it dawned on me (with the help of resources like FlyLady, LearnDoBecome, and some very insightful support people on my life) that my attempts at perfectionism were counterproductive and even damaging to my self worth, self-image, time management, relationships with myself and others….I could go on. I’m working hard at accepting myself for who I am right now, today, trying to remain in the moment, focus on one thing at a time and not sabotage my own progress on this journey by expecting myself or others to be perfect. I love the definition you shared for the word “perfect”. It’s a great reminder that God’s not finished with me yet, that He doesn’t ask for me to be perfect, so why should I expect it of myself? I really like the one question a responder posted about whether we would look to God of we were perfect. I kind of doubt it for myself at least. God created us just as He intended and has plans to make us perfectly complete one day with Him in His Kingdom. As one Christian singer/songwriter makes note of, to God we are stained-glass windows….broken and yet beautiful when we allow His light to sign through us. Thanks for all you share, April. God bless you and your family. Catherine, what a GIFT to have you with us! It sounds like you are going through an incredible period of learning. I love it! Totally inspiring. 🙂 That image of the stained glass brought tears to my eyes. That’s exactly what I want. So grateful for you!